The advantages of building a shade house with OBAMALLA, instead of building a greenhouse. The cost per square meter of the shade house is 1/10 of the cost of a closed system. The shade house improves the environmental conditions in crops. The idea of cultivating vegetables under a shade house originally comes from the need to take advantage of agricultural land in arid and semi-arid desert climates (such as Baja California, Almeria and Morocco), areas where phytosanitary conditions and good draining lands exist but the weather and insolation can be extremely strong for crops to grow without water stress or an excess of sun. A shade house is basically built with hardwood poles or metal tubes installed vertically on the ground (with or without a concrete base) and cable netting over the tips of the poles. These cables are installed at 90 degrees creating a support system for the shade cloth that will be installed on top. The chosen shade cloth depends on the type of crop; the ones that are used the most provide 35% or 50% shading. The most durable shade cloth under tropical sun conditions or highlands is the black one; and the cheapest is the one woven with flat thread, like the Raschel type. 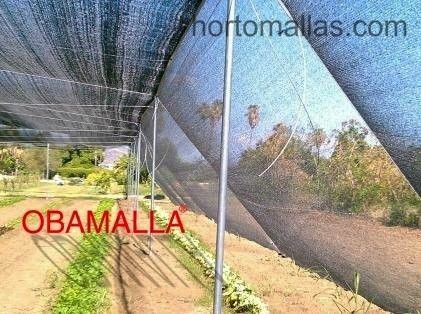 OBAMALLA is the most renowned brand in the Americas and the Iberian Peninsula that offer netting for shade products for crops. It promises many active use cycles in order to help lowering daytime temperature and keeping some of the infrared heat accumulated during the day inside the structure of the shade house. A shade house improves the conditions for the good development of a crop. The main difference (without getting into the finest details about the advantages of a high technology greenhouse) is that the shade house requires a smaller investment than the one required for the greenhouse. But the greenhouse can control important elements such as humidity, because the plastic cover avoids the passage of rain and can catch and maintain (through sensors and automated mechanisms) the relative humidity ideal for sensitive crops such as tomatoes and peppers. Contrary to that the shade house will be more permeable to rain, that’s why it is commonly used in semi desert climates. A good shade house will also have cables and mesh on the perimeter edges of the structure installed diagonally towards the ground, this in order to be able to give shade during the early morning hours or during the afternoon, which is when the sun has an angle that can burn the plants on the edges of the covered land. This mesh also acts as a wind breaking system helping further in the protection of crops against mechanical damages caused by atmospheric agents. 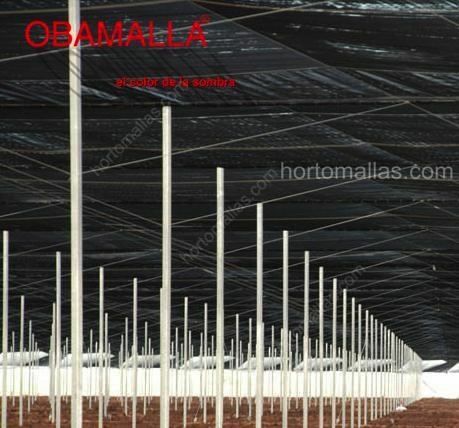 This control system built with OBAMALLA privacy mesh allows to reduce the amount of time it takes for the crops to react towards phytosanitary agrochemicals and changes in nutritional mixtures, reduces the risk of diseases and allows a better and a larger management of factors such as temperature, luminosity and humidity. Inside the structure of a shade house the same cables or poles that keep the weave in its place are used for the installation of the staking, similar to the HORTOMALLAS trellis mesh. 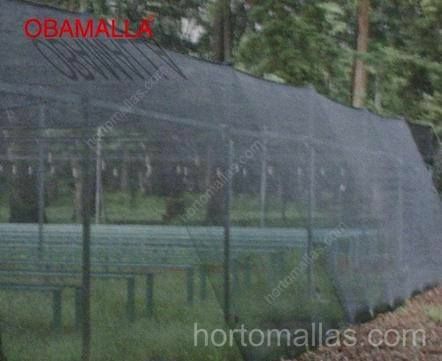 The trellis mesh available in hortomallas.com increases the cost effectiveness of the crop by reducing the necessary workforce in comparison to agricultural raffia; it also reduces the mechanical transmission rate of phyto-diseases. A shade house acts as the GREENHOUSE in inducing and forcing a precocity of the crops, which allows the farmer to get its products to market weeks earlier before its rivals and being able to sell the products at the highest price. The shade house also increases the density of the crops, improves the coloring of the fruits, and most importantly it increases the effectiveness of beneficial insects, which are used for management, biological control and pollination. A crop under the shade cloth allows the use of agricultural equipment; the vertical exploitation of the cultivation space reduces hydrological and thermal stress (reducing the day-night thermal delta), which prevents the fruits from cracking. The shade cloth in general decreases the need and dosage of agrochemicals and thus, the toxic waste in vegetables and its fruits, and it’s easy to use.